Yes, we've had an extremely mild Winter. I am still sooo ready for Spring. To get our house one step ahead of Mother Nature (maybe she'll get the clue) I have 'freshened up' our living room for Spring. 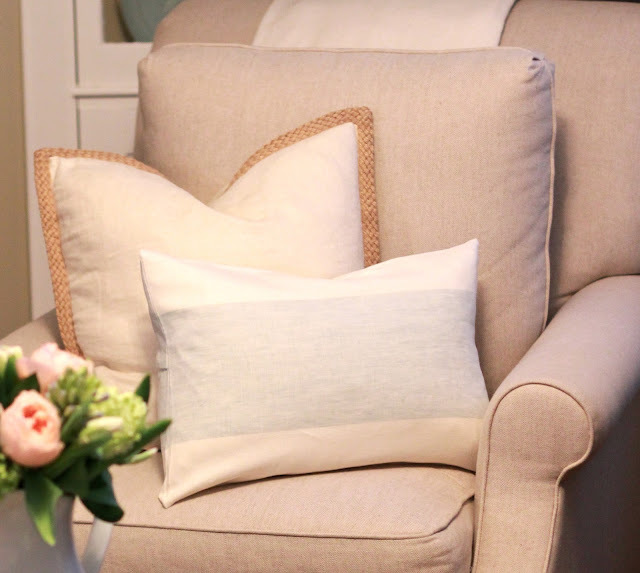 Gone are the warm winter pillow cases and throws - welcome fresh white (and striped) linen. I took it a step further this year - I replaced our framed prints above the mantle to reflect a brighter season. 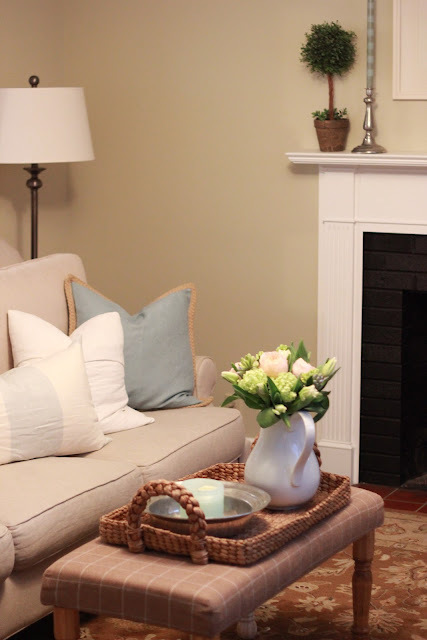 This year, instead of just hanging your spring wreath on the front door, try giving your family room a fresh face life. It might seem a little silly to redecorate your home for every changing season, but little changes can go a long way. It is amazing how replacing a couple of pillows and swapping out artwork gives our living room a completely fresh and airy feel. What's that? You don't have a budget for redecorating every 3 months? Try making your own pillow cases. I made the white and pale blue striped linen cases from 1/2 yard of fabric ($15). They couldn't be easier to make - I made them both in about 20 minutes. It requires a folding, ironing and sewing two straight lines. No zippers, no buttons. I'll be posting the DIY instructions later! I used the fabric vertically. I had plans to over the ottoman, too, because I thought it was too dark and heavy for Spring. Once I put the new pillows in place, the room already felt so much lighter that I didn't need to do the ottoman. By the way, we made the ottoman/bench ourselves just like we did for the one in Emma's Nursery - just a different size and shape. Flowers, of course, brighten any room. These were from Mike for my birthday last week. Didn't he do a great job? 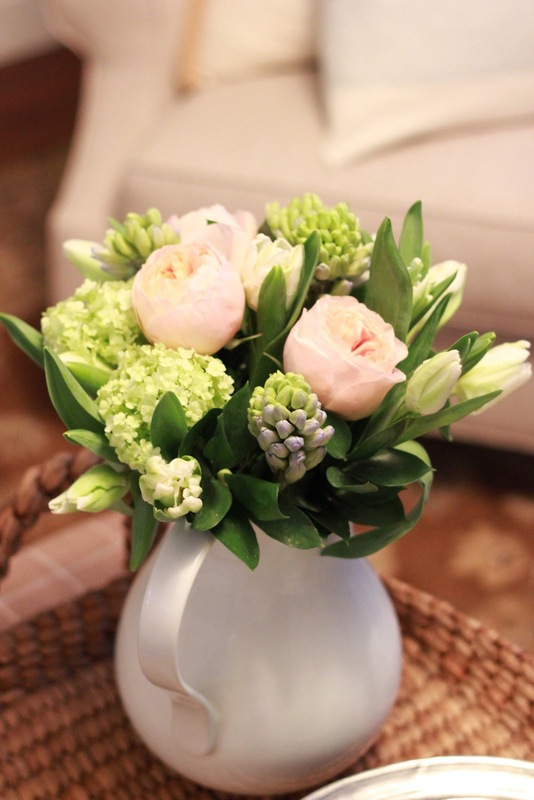 White parrot tulips, purple hyacinth, peach garden roses and green viburnum. Don't feel confident in your floral arranging skills? Put them in a pitcher! I like how casual and effortless arrangements look in a pitcher - like you gathered them from your own garden and just plopped them in. 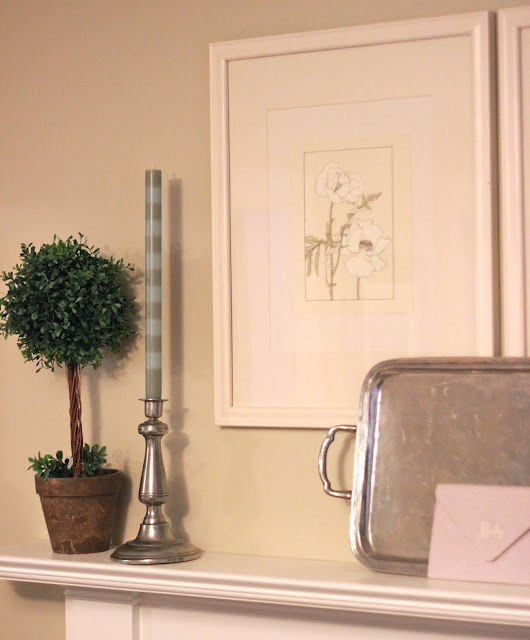 Here is the freshened mantle - two new prints, two new candles. Aren't these candles fabulous? They are Anna Candles (www.annacandles.com), $24. I got them at a little boutique in Woodstock, Vt. They are a little out of the box for me - but I love the little bit of whimsy they give the mantle. I always use botanical prints - for some reason they are the only type of artwork I'm really drawn to. I love these white flowers on a cream background. I found the image online and printed them myself. I tear the edges of the printed paper so they appear to be out of an old book. Your blog is lovely and I read it everyday. You've got great ideas, although I'm a Mary not a Martha, so I'll never do them, just enjoy watching you do them! :) FYI: in your first paragraph you left out the word "ahead". "to get out house one step "ahead" of " Sorry, I'm an editor/writer. Drives friends crazy. Besides the graphics here are great, so figured you'd want the writing spot on too. Btw, the Emma baptism post is beautiful. Truly. Looks wonderful. I love the topiary's on the mantle as well. We have had a very mild winter in Alberta Canada as well. What color did you use on the walls? Love the color of the walls against the white trim it makes everything calm and serene.